Being able to centrally manage your calls is far more efficient than having multiple offices scattered around the globe, and the costs savings can be significant. The largest of the three Baltic republics, Lithuania regained its independence after the Soviet Union collapsed in 1990. If you do business in Lithuania or are exploring the Lithuanian market, virtual phone numbers are a useful and affordable way to start building a local presence. A virtual phone number is highly portable. It is not tied to any given phone line, but rather rings to the number that you designate. You can even change this designated ring to number as your needs change. Many Lithuania virtual number users change the ring to number several times a day, such as when the move between their homes, offices, and mobile phones. With a Lithuania virtual phone number, your phone number appears to be local to Lithuania. 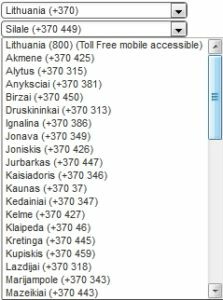 You can get either a toll free virtual number or a regional one for Lithuanian cities like Akmene, Moletai, Plunge, or Silute (to name a few). Thus, callers in Lithuanian will view your virtual number as being local to their country. Meanwhile, the actual phone that rings may be located in another country. For example, you could set up your Lithuania virtual phone number so that it rings to your office in London. Had you given your customers UK number, they might not call because your business does not appear local. They might worry about how to dial an international number or pause due to cost concerns. In contrast, when you give them a toll free virtual Lithuania phone number or a local Lithuania virtual number for their city, these concerns will never occur. Using virtual numbers is a great way to build a local presence in another country. 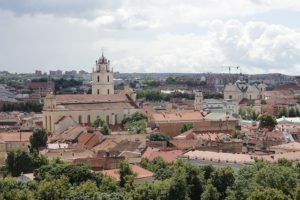 Instead of renting an office in Lithuania and hiring local staff, you can order a virtual phone number and take incoming phone calls from callers in Lithuania at your main office or call center located somewhere else in the world. Being able to centrally manage your calls is far more efficient than having multiple offices scattered around the globe, and the costs savings can be significant. Having a virtual Lithuania phone number while striking business deals in the start up stage can also be beneficial. For one, it will signal to potential partners that you are serious about making a move. At the same time, it will make it easier for them to initiate conversations with you. Our Lithuania virtual numbers are available on a month-to-month basis with no contract. Simply choose the number type (toll free or pick a city), a monthly plan based on the number of minutes you’d like, and choose any optional add-ons such as call recording or rollover minutes. Enjoy exceptional sound quality and advanced features, and then cancel at any time. How are you using virtual numbers in your business? Lucky me I found your website just when I needed a conference call from Barbados not Lithuania. I signed up, thanks.